I am very very confused. My fiancee and I are purchasing a handgun and are going to take the class to get our concealed permits. In the meantime, my question is this: are we or arent we allowed to keep the handgun loaded with us in the car until we get our permits? We live in a high crime neighborhood and would like to have piece of mind by keeping our weapon with us. Is it legal to keep it in the car even without already having our permits? Yes, you can, provided that it's "securely encased" and not immediately accessible. In the glove box, locked or unlocked, meets the requirement. In a closed gun case or snapped holster likewise. On the seat beside you or on your person does not meet the requirement. (5) POSSESSION IN PRIVATE CONVEYANCE.--Notwithstanding subsection (2), it is lawful and is not a violation of s. 790.01 for a person 18 years of age or older to possess a concealed firearm or other weapon for self-defense or other lawful purpose within the interior of a private conveyance, without a license, if the firearm or other weapon is securely encased or is otherwise not readily accessible for immediate use. Nothing herein contained prohibits the carrying of a legal firearm other than a handgun anywhere in a private conveyance when such firearm is being carried for a lawful use. Nothing herein contained shall be construed to authorize the carrying of a concealed firearm or other weapon on the person. This subsection shall be liberally construed in favor of the lawful use, ownership, and possession of firearms and other weapons, including lawful self-defense as provided in s. 776.012. If you have a center console that can be closed would be an ideal form of car carry. It is easily within reach without taking your eye off a potential threat and it is perfectly legal. Good luck. You have to have the conviction to see it through to the end, good, bad or ugly. Once it starts you are IN IT and need to stay focused. On the seat beside you or on your person does not meet the requirement. 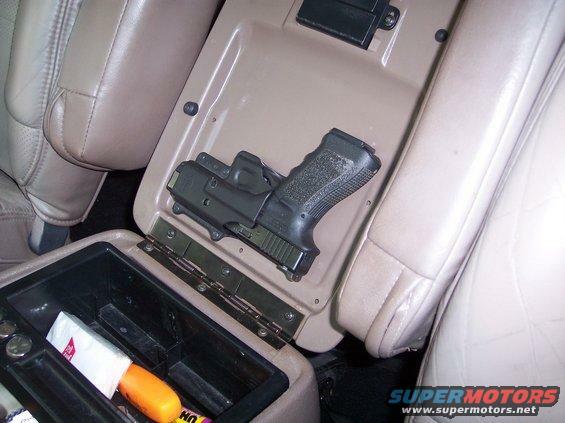 To clarify...It can be on the seat as long as its in the case or snapped holster. Before my CWL I would either keep it in the glovebox or in the center console next to me. "It's Fumbles...it was always Fumbles." Deadeyedick... Nice set up you have there, been wanting to set something up like that in my truck as well. Where did you get that clip you installed on your console lid? If I'm not mistaken, it's probably the holster that came with the gun. I know with my XD-40, the included holster makes a good clip for your vehicle, especially since I don't use it as a holster. Liberals are like Slinkies...they're not good for anything, but still bring a smile to your face when you push them down a flight of stairs.